After Prince George's birth, diamond eternity ring from Annoushka and a diamond flower brooch a pink stone. kikimcdonough Special Edition Green Tourmaline, Green Amethyst and Diamond Earrings. She's had that citrine ring since 2008. I find the brooch for George hard to believe as we've never seen it...not once in 5 years (if I remember correctly). As the Kiki's for Charlotte I doubt...she has so many Kiki's and has order bespoke ones herself...plus isn't not very original. Maybe if we were talking nice Ruby (July--George), Emerald (May--Charlotte), and Diamond (April--Louis) jewelry I'd be more likely to believe it. Or something that just screamed 'Mother Jewelry' like a ring/necklace/bracelet with the kids birthstones. oh, she did...this one? Interesting, than all the news outlets are wrong. I checked I think almost all news/jewelry/blogs, and they all said the same. Just one such link, there are plenty talking about it. Oooooooh. Hello. 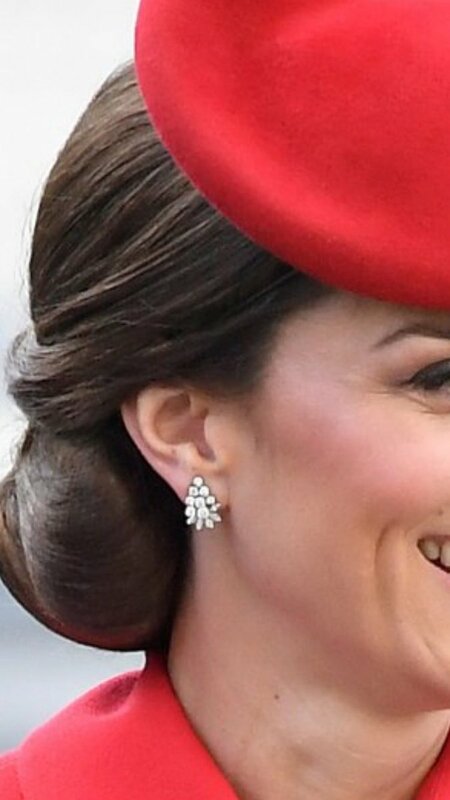 Kate in proper non-Kiki earrings shock? You say “non-Kiki” and I am an immediate fan, lol! Lol! I see an upside down bunch of grapes! I was think upside down blackberries. Thanks...& now I’m off to the grocery for some delicious produce! Is it her late mil earings? Or it's new? Kate's ear fruit looks lovely. I'd like to know the provenance. I would think new, or a recent gift/lend from a higher up in the BFR. If she picked them out herself her taste is improving by leaps and bounds. I'm only being somewhat facetious here: It's nice to see our Duchess growing up.